Get your skates on! 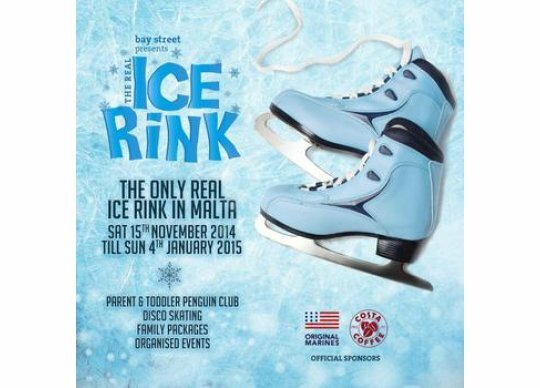 Bay Street will host to the only real ice rink in Malta this winter, giving Bay Street visitors the chance to enjoy real ice-skating. To ensure that customers of all ages and abilities can enjoy the ice, we have a range of aids, from twin blade ice shoes to help little ones get their balance on the skating surface, and up to ten fun skate penguins. For customers with reduced mobility, a special support frame will be available, as well as dedicated sessions for wheelchair users. Schools and community organisations can arrange a private hire booking. The real Ice rink is open until January 5th 2015. 10am-10pm Monday-Sunday (Last entrance to rink at 9.15pm). 20 minutes skating including skate hire: €5 per skater.